Ferguson Witnesss Told Investigators That Michael Brown Charged Cop "Like a Football Player. Head Down"
The witness’s account of the unarmed Brown charging Wilson--even after he had been shot in the hand during a struggle at the cop’s patrol car--supports the officer’s contention that he fired a series of shots as Brown bore down on him. Testifying that he thought Brown (seen at left) would “kill me if he gets ahold of this gun,” Wilson said that he discharged the weapon inside the cruiser. The gunshot, he added, “kind of startled him and me at the same time.” The teenager then “looked up at me and had the most intense aggressive face,” Wilson recalled. “The only way I can describe it, it looks like a demon, that’s how angry he looked.” Brown, Wilson testified, then raised his arms and punched him in the face. 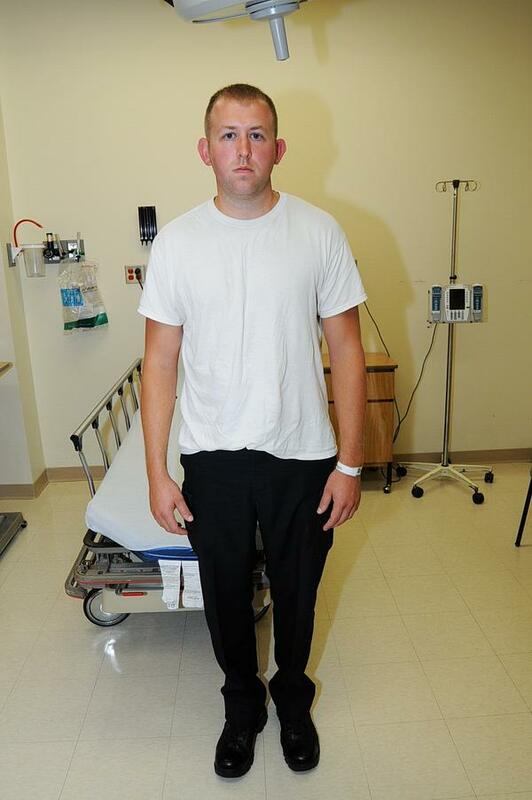 Wilson is pictured above in a police evidence photo taken at a hospital hours after the August 9 shooting.